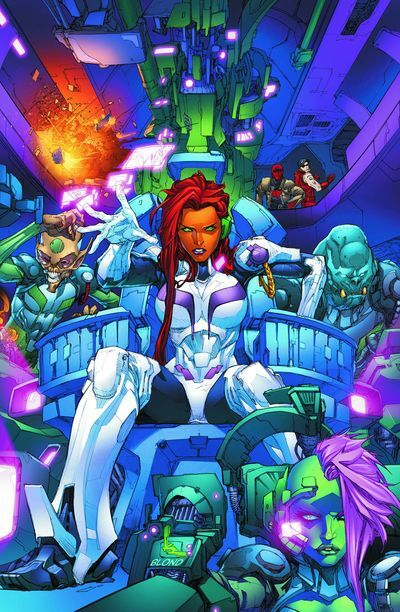 Who knew that Starfire was such a strange dame? She never appeared like a lame Jane? Her people did disagree. Which is why she had to flee. From a four letter word that is most probably profane. You know, something conjured up by Writer: Scott Lobdell; Artist: Kenneth Rocafort; and Publisher: DC Comics in May 2012. Oops! 'Star Light, Star Bright -- First Star I Kill Tonight!' reminds me that I should never take drugs whilst watching Star Trek. I may go to places where other people have never gone before. Well, ditsy blonde stewardess, Isabel unknown-surname, thought that her date with some chap called Jason Todd would end on a very nice note when she kissed him. But no. An alien called Orn comes crashing down from the sky, prompting Jason to stick on a Red-Hood, and his buddies, Kory and Roy, to suddenly pop out of nowhere, and join the fray. Don't fret though. This fight does not continue. This Orn chap is an old friend of Korys, and teleports 'the gang' to an alighting battleship, so Kory can defend her race from 'The Blight'. Meanwhile, in the back-up feature, Essence commences her war with 'The Untitled', by sticking her face in front of the fist of some nutter who has a devilish smile. I had a good chuckle when Isabella said to Jason 'You don't really own a dry cleaning business, do you?' just after he put on his mask and starts shooting at Orn. My favorite sections were those featuring Isabella, because it showed how she tried her best to cope with these strange turn of events. Well, sometimes it is great when a writer, like Scott, tries to ground his adventures by sticking in the 'the average Joe'; just so that we can get another point of view of said scenario. This tactic lends itself to pathos - which is always a good thing in my book. With the benefit of hindsight, I found the battle between Orn and the gang a groan-worthy way of beginning this story, because it never really went anywhere within the overall narrative. Now if his race could build a teleporter, why couldn't they have also built a telephone and called Starfire too? STORY: I suppose the only originality where the story is concerned, is that Jason took his date along with him on his up and coming adventure. As I said previously, this aspect can make this 'arc' much more grounded and alternate as a piece of joviality. ART: Although I was not that keen on the initial battle scene within the context of the overall story, the battle in itself was very well choreographed by artist extraordinaire, Kenneth Rocafort. Also, I loved the transitional effects when the gang 'teleported' away. Very 'Beam me up Scotty'. Not Lobdell. ISABEL: Blond British actress, Suzanne Shaw, has the right bra, the right face, and if combed properly, the right hair to play this silly cow who has a crush on bad-boy Todd. Agreed? ORN: Would it be too predictable of me to say that this friendly giant reminds me of Michael Clarke Duncan from 'The Green Mile' and the Tim Burton 'Planet of the Apes' movie? What do you mean 'Yes'? Sod you then. Come Fly With Me, Come Fly, Come Fly, Away. To The Planet Tamaran. Now this story had a bit of everything really. A bit of kissing. A bit of fighting. And a bit of exposition to set up next issue set in space. So why not compare it to something like 'Star Trek', as that had a bit of everything in it as well? Now this opening chapter to a bigger story arc was a bit 'hit and miss' from my own point of view. I liked the personality. I am indifferent about the tale. Plus I am intrigued with how this will all play out next issue. Moreover, I have to give a big shout out to Mister Lobdell himself for tweeting me last week about what I thought about his work. Bless you sir. Much appreciated. I may not be as dynamic as you my friend, but I sure am sillier. Shazbot!